Half of UK consumers are bombarded with badly targeted marketing, new research has revealed. The study by YouGov for the Chartered Institute of Marketing found that 61% have been sent marketing material about a hobby or interest they don’t have, while 35% receive promotions for offers in areas that they neither live in nor visit. Half of the respondents reported that the marketing they received was never relevant to them, and 55% believe most of the organisations behind the marketing obtained their contact details without their consent. 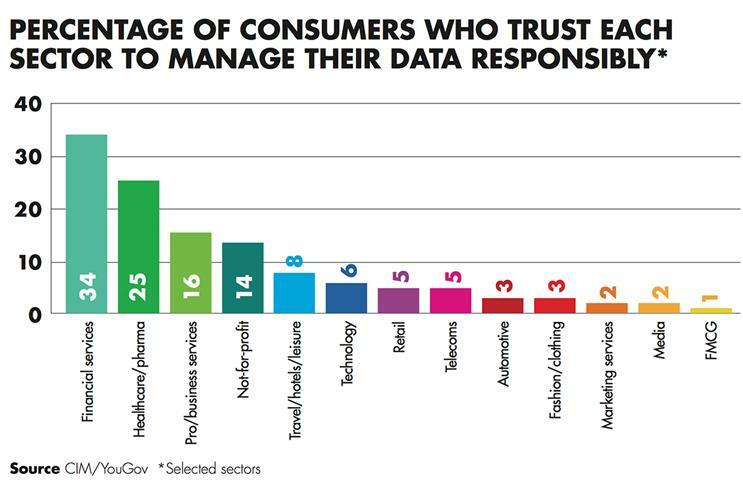 The 2,000 UK adults who were surveyed were also asked which business sectors they trusted in terms of data management. No sector was deemed trustworthy by more than half of respondents, with financial services (34%) and healthcare/pharmaceuticals (25%) scoring highest. FMCG and media were found to be trusted by just 1% and 2% respectively. The study coincides with the launch of CIM’s Data Right campaign, which encourages companies to handle customer data more responsibly. The CIM is asking businesses to be clear with consumers on how their data will be used; show respect for the information; understand the legislation around the area; and help customers understand how data collection is beneficial. Chris Daly, chief executive of the CIM, said: "Until businesses step up and show their commitment to best practice, they risk alienating their customers and damaging their brand." It's a question of trust. Or is it?